Is Our Cat A RagaMuffin? ← Is My Cat A RagaMuffin? We got our cat Rocco from The Humane Society four years ago. Just recently I saw a RagaMuffin cat in a magazine that looked similar to him. I know the chances are slim, but I was wondering if he may be at least part RagaMuffin. He is a very sweet natured cat. He loves people and has been complimented on being extremely friendly. He is very popular with our friends and family. His fur is thick and very very soft. He has a big, fluffy white chest and a fluffy tail. His forehead is rounded and he has a prominent dip in his nose. His paws look thick (wide) like pictures I have seen of RagaMuffins. We read that they act like puppies and he acts like a puppy. We call him puppy cat. He is not a big cat and has medium eyes. Not characteristics of the RagaMuffin. I thought it would be fun to have an opinion. Hi Tamara.. thanks for visiting and asking. I guess you might have read the page on What Breed is My Cat, which discusses this subject generally. If you don't have documentary evidence that Rocco is purebred then strictly speaking his is not purebred and therefore not a RagaMuffin as RagaMuffins are purebred cats. But as you infer he could be purebred but the papers are missing. The most likely outcome that Rocco is that he has some characteristics of a RagaMuffin but is in fact a moggie. RagaMuffins come in all coat colors and patterns so Rocco is not excluded from being a RagaMuffin on that basis. RagaMuffins have, what I would call, a nice normal appearance. Their appearance alone does not mark them out or help us to recognise them particularly as any coat type is acceptable. Other breeds, for example a contemporary (flat faced) Persian or the Sphynx cat or the skinny Oriental Shorthair, are more defined by their appearance. That makes it harder to answer your question. I am not doing very well, am I?! Conclusion: On pure chance and statistics Rocco is probably a random breed cat but there is a chance that he might be a RagaMuffin mix or even a purebred cat but you won't know. Some purebreds do not have the correct appearance of the breed. These are sold as pets to customers. That also muddies up the water. 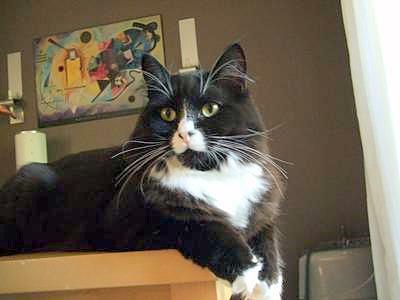 He is a fine looking cat by the way and he has a great character, which ultimately is the most important factor.